Would anyone suspect something serious to come out of a film in which a rubber tire comes to life and kills people, using telepathic powers? I would not think so. Why would this happen? As the movie’s mantra suggests, “No reason.” It is fitting that I saw Rubber around the same time that I watched Scream 4. 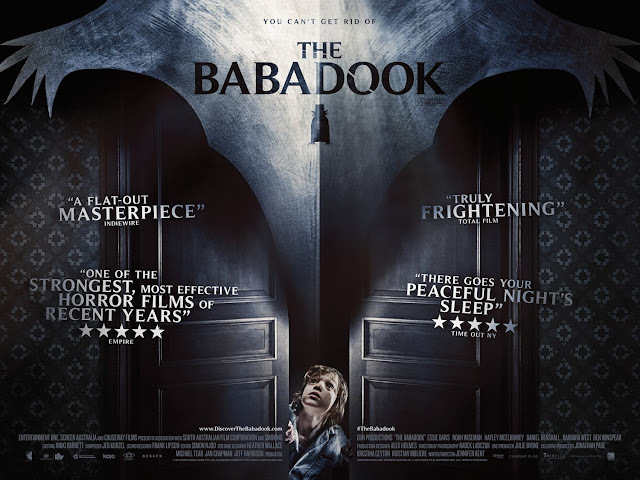 Both films are designed to satirize horror and film culture and subvert audience expectation. While I think Scream 4 only managed to point out these themes without being clever enough to pull off something more meaningful, Rubber is more of an experiment, made to address the tropes and status of horror films and the audiences that watch them. While very bizarre, self indulgent at times, and overlong, the film works as a ridiculous meta-horror-comedy pushed to the extreme. As I have already explained, the premise is incredibly simplistic. 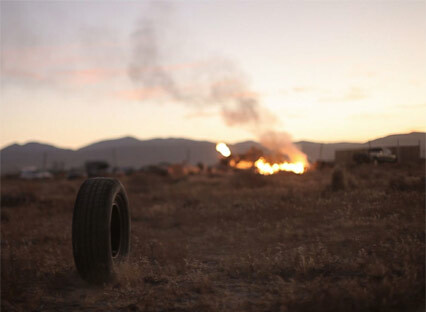 In California, a tire comes to life and embarks on a killing spree. Starting out small, learning to roll and crushing things under its wait, the tire soon advances further by using telekinetic powers to blow up anything that crosses its path (I am sorry if this is where I lost you). Meanwhile, an audience watches the events unfold through binoculars. They have been setup in the distance by a policeman (Stephen Spinella), who is apparently all too aware of this tire’s abilities, along with the fact that he is inside the constructs of a film. Things may become too much for even him to handle, as the tire continues its killing spree with seemingly no way to be stopped. I could not even write that summary with a straight face as it is just ludicrous to describe. 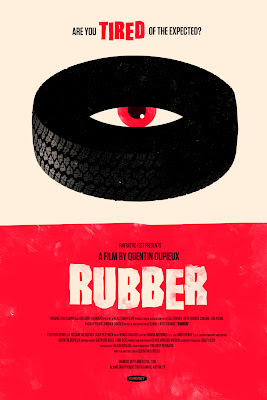 However, I got exactly what I was expecting, after hearing about a film that revolves around a killer tire. That being said, the movie is also very aware of how preposterous it is. There is no way that writer/director/editor/cinematographer Quentin Dupieux could have made this film without having an exact understanding of how this film would be regarded. While very drawn out, this film has a sense of humor about itself that is very fitting with the tone. 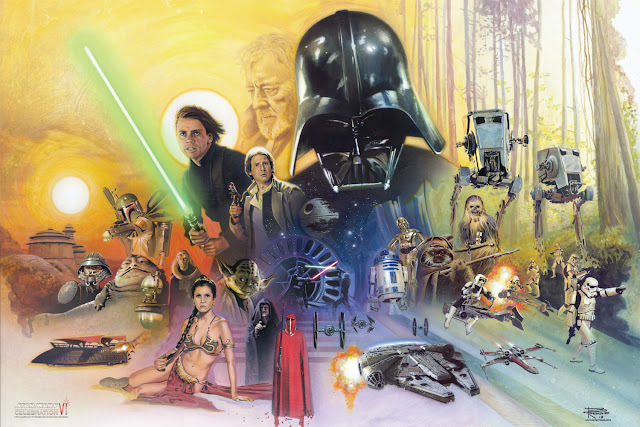 It is a little hard to explain the exact kind of appreciation I have for this movie. As it stands I would only assign a marginal recommendation rating to it. I guess the benefits I saw from watching the film relied on how willing it was to embrace its bizarreness. 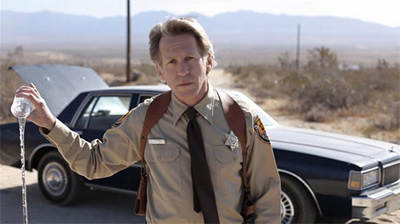 Starting with the opening of the film, which has the policeman drive through a row of chairs, destroying each one with his car, before stopping, exiting his vehicle, and delivering a monologue directly at the camera, only to have it revealed that he is addressing an audience that watches the events of the films go down, this film has already established that it literally knows how weird it is. The use of an audience watching this film in the background is like Dupieux having his cake and eating it too. They consist of mostly annoying people, chatting about what they see, making the kind of comments that a stereotypical audience would make during a regular slasher movie. The idea is to obviously pull the rug out from under those who would comment on this film, were it to be played any straighter. It only kind of works, but eventually grows tiresome, before it just outplays itself. That is the main problem with this film. In concept, there only seems to be enough material for a short film. Rubber film lasts for 85 minutes and certainly drags in its midsection. 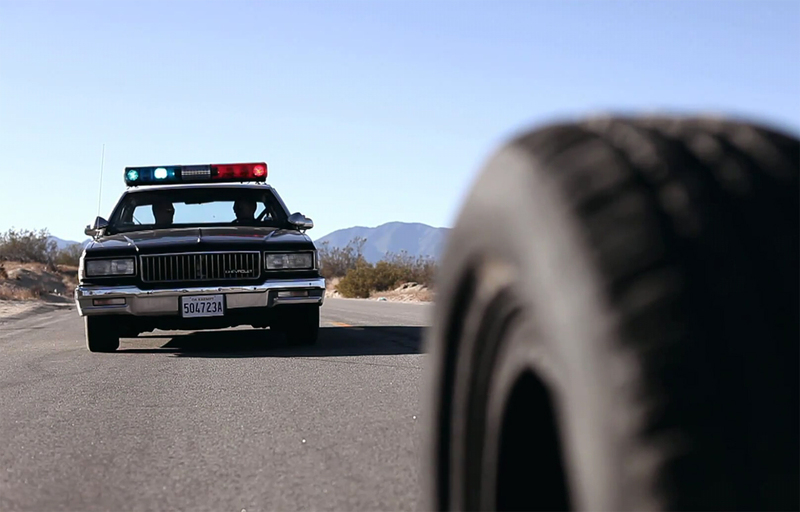 Who would have thought that you can only do so much with a concept about a killer tire? There is not a lot going on, but the film really tries to pad itself out by having elements such as the audience aspect, the role of the policeman, and even small expansion on some of the supporting characters. This film really does not need any of this. 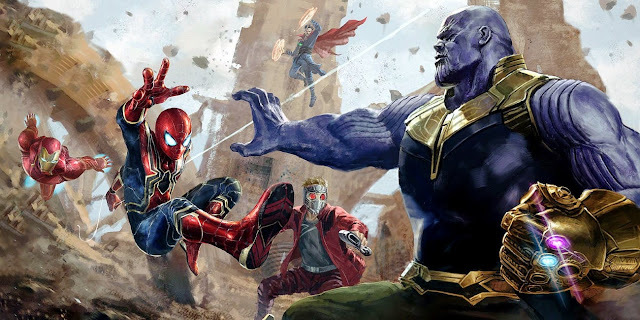 It would have remained just as much a unique experience without these other developments, but it would have probably lost the less-than-subtle meta layer that the film is going for. There is not much to speak of in way of characters. Besides the evil, charismatic tire (played by Robert, according to the credits), you have the policeman, who is in on it; the policeman’s assistant, who sees to the observing audience; a boy who sees the tire do his work, but no one believes until it’s too late; a women, whom the tire seems to be stalking (and this wouldn’t be a slasher film without her having a gratuitous shower scene); and then other characters who are doomed. 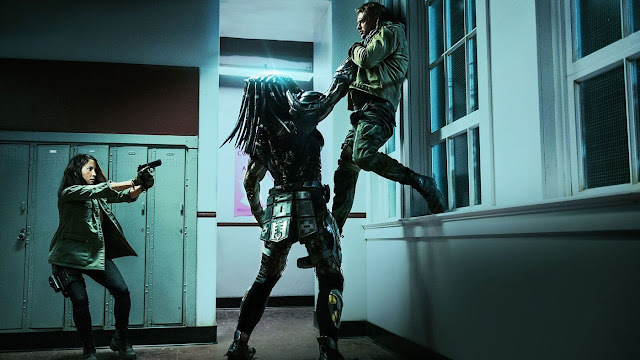 There is certainly a lot of quirkiness involved (there would have to be), but you really have to be in on the tone of this film to appreciate what is being brought by these folk to the film. From a filmmaking standpoint, this is actually a solid example of what can be accomplished in crafty, low budget cinema. Given that this has to be a film about a possessed tire, the film manages to provide a convincing perspective of a tire moving on its own, through a clever mix of mostly practical props and some subtle special effects. Also aiding this is how the film manages to portray the menace of a tire, which is surprising. In any other movie, the way some scenes are constructed could be fitting of a successful suspense sequence. Adding to all of this is the score, which is at times fitting for a darker toned film and at other times perfectly contrasting in a humorous way to the drama that is unfolding. I certainly found success to be seen in the presentation of Rubber. This is quirky, independent cinema at its most extreme. There is nothing profound about what this film presents, but I found it to be intriguing enough, in a ridiculous sort of way. I may get some flak from my other buddies at Why So Blu for this next statement, but I appreciated what this film had to offer more than something like The Human Centipede, which is better in concept/discussion rather than its actual execution. 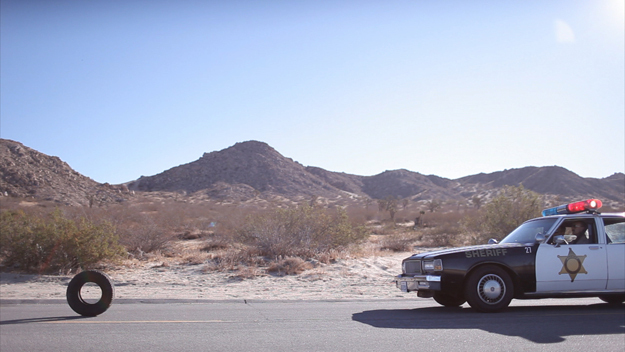 Rubber is far from perfect, but it has ideas, solid filmmaking, and fun with what it achieves. 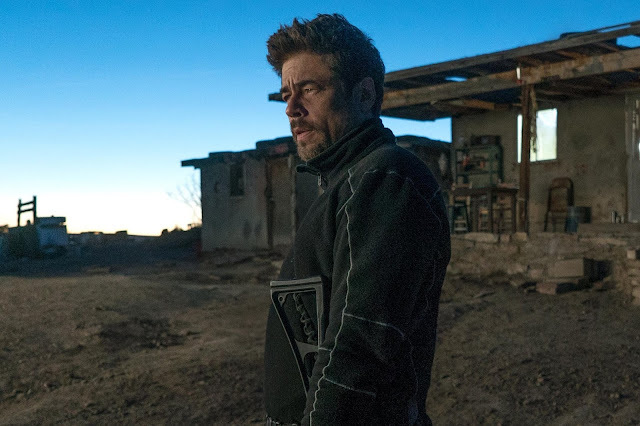 Certainly one of the stranger films to watch, but given its Video OnDemand status and incredibly limited release, you should not be surprised by its lack of mainstream appeal. So, along with Hobo with a Shotgun, this is an interesting, yet strangely entertaining time for the flicks you can find OnDemand. Zach: I’m not joking. I’m sure this tire killed Martina!